HERE IS A PRIME EXAMPLE of how the discovery of a vintage artifact can lead to a research quest that uncovers all sorts of interesting – at least to me – information. An eBay auction recently yielded a set of 13 acetate discs dated 1944–1945. 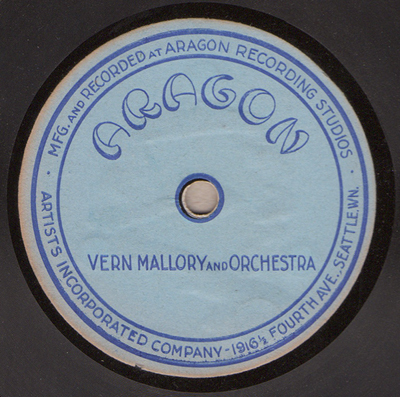 They each have labels from a previously unknown Seattle facility: Aragon Recording Studios (1916 ½ Fourth Avenue). It has been known that a local jazz impresario, Art Benson, had run the Aragon Ballroom on that site during the 1940s and 1950s, but the associated studios & record company are brand new factors. Now, some of these discs are credited to Vern Mallory and his Orchestra, & Mallory himself was certainly a remarkable fellow. 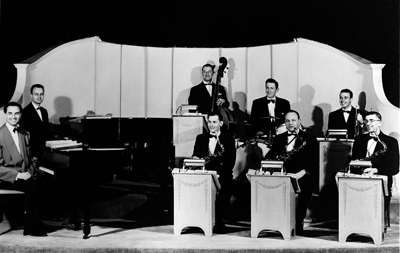 He’d arrived in Seattle back in the 1930s, joined the Musicians Union (AFM-76), & rose through the ranks until he was leading his own band – one of the very few white Swing-era bands that played actual jazz. But, even that’s not exactly correct: Mallory was actually one of the few white bandleaders who was also open-minded enough to periodically bring aboard some of Seattle’s top African American players – members of the town’s other racially segregated union (AFM-493) – including Ulysses “Jabo” Ward (sax) & Roscoe Weathers (sax). 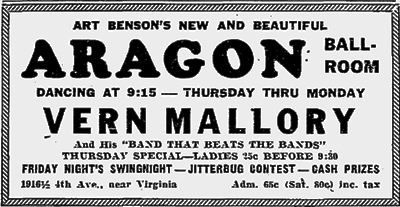 But regardless of the racial composition of Mallory’s combo at any particular time, they were one of the few bands with any white players who were hip enough to be booked to entertain the mostly black crowds at the Savoy Ballroom (2203 E. Madison Street). As for Art Benson: in the mid-to-late-'50s he went on to "discover" a number of local talents and bring them to Chet Noland's Celestial label – including rockabilly pioneers (the Maddy Brothers) & one of Seattle's first black rock 'n' roll acts (Joe Boot & the Fabulous Winds) both of whom I've written about previously.